Discussion in 'Whitetail Management' started by Hoss, Jan 29, 2019. For timing, my guess would be March/April. Since I have some chestnuts in the fridge, I was researching where they like to be planted. Sounds like well drained to sandy soil is better, leaning to acidic soil. I plan to measure pH and adjust with sulfur if needed. Where to plant might be as important as when. You're overthinking this. I planted trees for years with a forestry service, besides planting hundreds of my own. Calendar date isn't as important as you think. If the frost is out and things are warming up, you can plant, but DON"T mud them in. If it's dry enough to do garden work, you can plant. Generally, the earlier you plant the better because you can catch the good rains. What you DON"T want is to plant them and then have no rain for a few weeks. In that case you should water them. Make sure to plant them at the right depth and firm the soil around the roots and you should be good. Weed and grass control around the trees is critical the first few years. And protect them from the deer! goatman and Daver like this. Awesome to see an 18 year old starting out doing this kind of thing. Keep it up. You will reap the rewards of your hard work some day, but also every year you plant. Good job young man! You remind me of an old saying...the best time to plant a tree is 20 years ago and the 2nd best time to plant one is today. You are young enough to be able to see the fruits of your tree planting efforts for many, many years! Jbohn and cybball like this. Thankyou for the encouragement appeciate it! I get trees from them, but in late april when I get them, they are fully leafed out, so I just temporary keep them potted up until danger of frost/freezes are gone until plant them. You'd have to ask them when they are dormant if you want them shipped then. 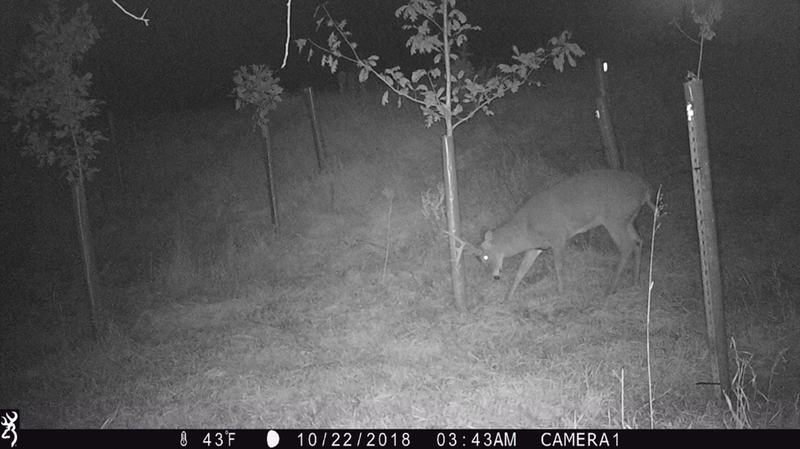 Also make sure to protect your trees from wildlife, and keep them watered the first year, lost a lot of trees because of those issues in the past. Check out the tree planting thread for a ton of advice. As far as trees you can “see” in ten years. I’d highly recommend oaks! Walnuts will grow fast also but I haven’t had as good of luck with those in tubes. Reds grow quite quickly and we have had even faster growth with chinkapins. Even had acorns after 5 yrs on the chinkapins. Here’s a 9yr old red oak protected by a 5’ miracle pro tree tube for size reference. Roughly 12-15’ tall on those red and chinkapin oaks. And this pic also shows the importance of protecting your trees! Rjack and Hardwood11 like this.